While we all know and love Burberry for their iconic checks that’s been translated onto trench coats, bags and even shoes of late, you might have missed out on these jewellery pieces that are slowly but surely gaining a fanbase for those into clean minimalist pieces. An extension of the first few pieces that were much more elaborate (remember that giant dangling floral crystal brooch), it is also worth noting that these pieces are now available in Singapore at their boutiques as well as over on their online store. First up, two geometric drop earrings that can be worn two ways. On the left, the Glass & Palladium Link Drop Earrings (SGD870) features a palladium-plated brass link that can be worn individually or paired together with the blue glass link for a full look. Over on the right, the Rubberised & Gold-plated Link Drop Earrings (SGD810) that intentionally comes mismatched for added visual interest. If you’re a fan of all things gold, the Crystal Charm Gold-plated Drop Earrings (SGD810) comes with a full gold plating and is adorned with engraved crystal stars for that extra bling. The Gold-plated Link Double Ring (SGD810) might look like a car when placed on its side, but it is actually meant to be worn across three fingers, where you slip your index and ring finger between the dual rings. Rounding up the pieces are two more that feature more crystals. 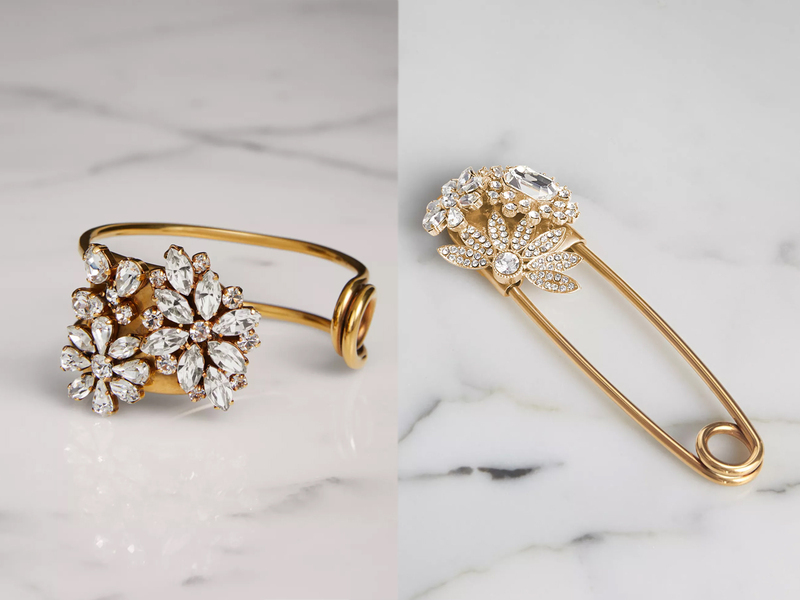 The Crystal Daisy Brass Cuff (SGD1050) is inspired by the British gardens, with hand-placed crystals coming together to form the shape of daisies. 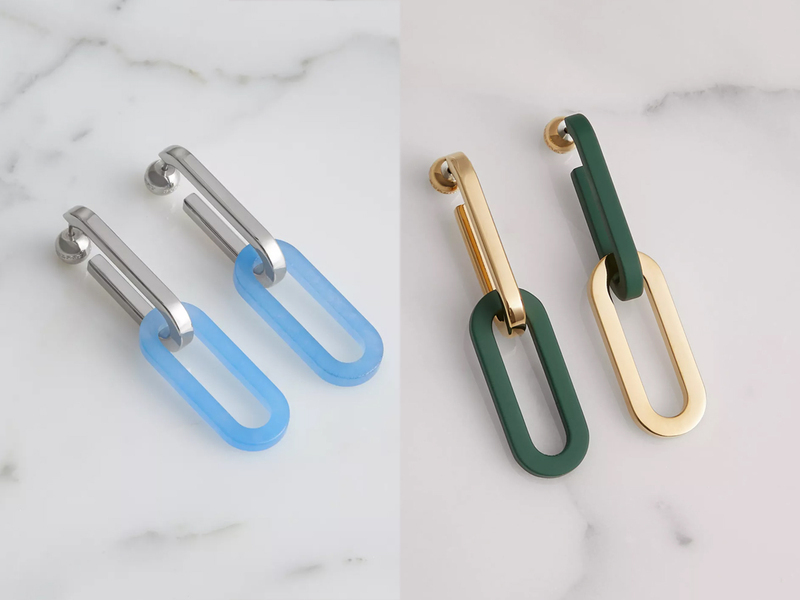 The Crystal & Brass Oversized Pin (SGD670), on the other hand, is something even the men can pull off, one that will look extra swanky on a knitted sweater. Or on a blazer. Even jazzing up a tee, for that matter. What’s great about these jewellery pieces is their ability to look expensive, without crossing the 4 digit mark. 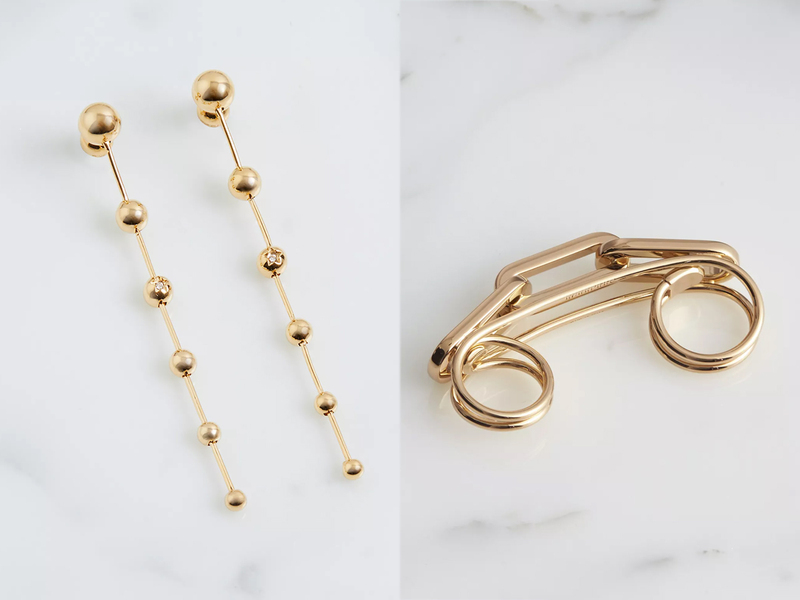 And considering the fact that these pieces already have the blessings of new Creative Director Riccardo Tisci, it is perhaps time to start adding these baubles to your collection.